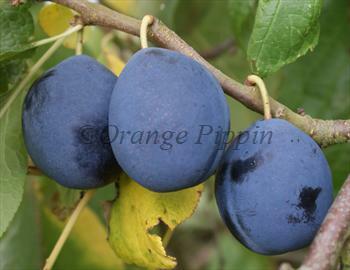 Merryweather is one of the most widely-planted and hardy damsons. The fruit is large by damson standards and Merryweather is in some ways more like a small plum. The fruit can be eaten fresh if left to hang on the tree, but damsons really come into their own for culinary use, where they can subsitute for plums yet have a distinctive rich flavour. Merryweather is a clingstone fruit - the stone is not easily parted from the flesh. Please fill in the details below and we will let you know when Merryweather damson trees are back in stock. Merryweather is in flowering group 3. Merryweather is self-fertile and does not need a pollination partner, although fruiting may be improved if there is a compatible tree of a different variety nearby. Since it flowers in the middle of the blossom season it can be pollinated by most other damson trees. Merryweather is a large vigorous tree, which tends to be spreading rather than vertical in its growth like most damsons. It is also more precocious than other damsons, and you may get a crop from trees which are 3-4 years old. Like most damsons, Merryweather tolerates wet and cold situations and is resistant to silverleaf.